Erva all weather guards are made with fully galvanized steel, and powder coated to maintain their attractive appearance. Made entirely in the US. We have a variety of colors for a variety of feeder types. Without our rainguard above, the food would have been frozen in the dish. 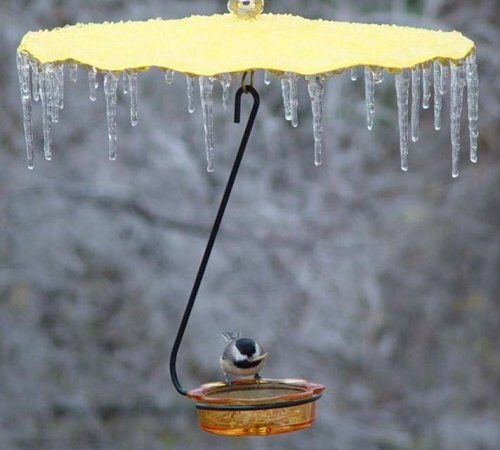 Attach these Rain Guards to protect your feathered visitors from the elements. Keeps out rain, so nectar isn't diluted. Keeps sun off nectar feeders and slows down the onset of fermentation. The generous 14" diameter size provides shade and cover while birds are feeding. Lost your Rain Guard hardware? Replacement hanging hardware set fits all Erva Rain & Shine Guards. Includes upper and lower loops and the small S hook.